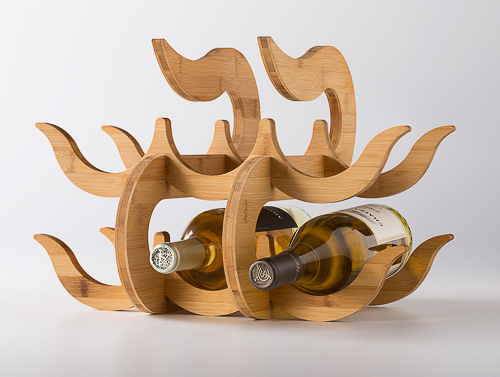 GioGio Design makes eco-friendly bamboo home accessories as well as leather, wood and steel jewelry. We think people should surround themselves with creatively-designed, cool, and smart products that are both functional and fun. Life is more interesting when we are inspired by the things we see around us every day. Place your order with us at the show and shipping (up to $25) is free! Jewelry orders of pendants and earrings are eligible for our "stag" jewelry display stand free of charge. 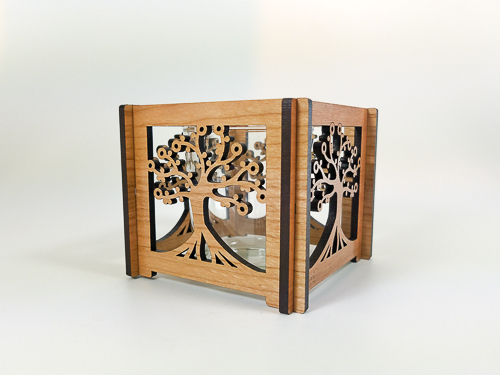 Our unique stands are made from ecofriendly bamboo. Made from laser cut cherry veneer. Clear finish. 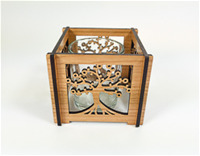 Holds one tea light or votive candle and includes glass holder. All of our home accessories are made of individual pieces that slot together without the need for fasteners. Putting them together like a 3d puzzle is part of the fun. This also allows us to ship them flat-packed, and is great for storage. Our products are packaged in a gift box with instructions for care and assembly. Please keep in mind that wood is a natural product and there is a range of variation in the color and shading of each sheet. The actual color may be slightly lighter or darker than shown in the photographs. All of our home accessories are made of individual pieces that slot together without the need for fasteners. Putting them together like a 3d puzzle is part of the fun. This also allows us to ship them flat-packed, and is great for storage. Our products are packaged in a gift box with instructions for care and assembly. We use eco-friendly FSC certified bamboo plywood with a natural linseed oil finish. Our cutting boards and sushi boards are finished with food-safe butcher block oil. Please keep in mind that bamboo is a natural product and there is a range of variation in the color and shading of each sheet. The actual color may be slightly lighter or darker than shown in the photographs. 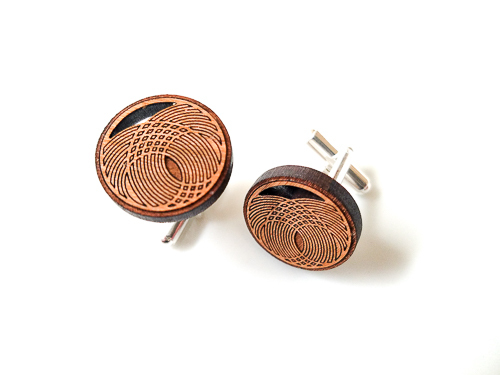 Cufflinks in laser cut & etched cherry veneer. Silver plated brass finding. Set of two. The geometric patterns featured on these cufflinks were inspired by architecture and design. Five styles available. We also make leather bracelets for men. Wood pendants come on adjustable genuine leather cords. Earrings have surgical steel ear wires. Leather bracelets feature an adjustable button closure to fit multiple wrist sizes. 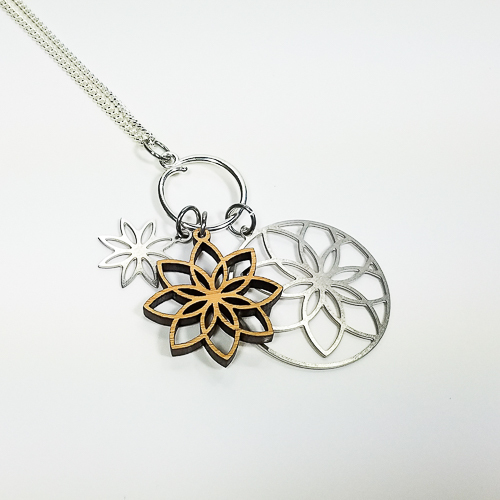 Our unique and fresh line of jewelry features alternative materials (leather, wood and stainless steel) and elegant, clean design. Our Natural collection features organic designs inspired by flora an fauna. Our Classical collection features geometric patterns inspired by architecture and design. Our stainless seel jewelry is light as a feather and never tarnishes. 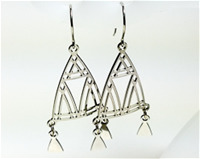 Earrings have surgical steel ear wires. Pendants come on silver filled or silver plated chains. Our leather bracelets are made from auburn or black vegetable dyed genuine leather. The are available with adjustable button closures to fit a variety of wrist sizes.